If you have not been to the fabulous exhibition about 150 years of Alice in Wonderland, it is still on until 16 April 2016. It is right in the foyer of the British Library, and it is free of charge. You can find more materials on the website of the BL and enjoy our review on the oblique tale, with pictures ranging from quaint to sinister, on this blog. A great piece of social history, literary history — and art & design history! There is also a new museum dedicated to book illustration at nearby King’s Cross: House of Illustration covers picture books, children’s books and much more, from political cartoons to scientific drawings. At the moment, E. H. Shepard, the illustrator of Winnie the Pooh and The Wind in the Willows, is shown from another angle: with paintings from the First World War. Did you know that you can find material on illustrated children’s literature – and even on illustrating it yourself – here at the Newsam Library? Try the search terms ‘Children’s literature’ + ‘Illustration’ or ‘Children’s literature’ + ‘Picture books’. 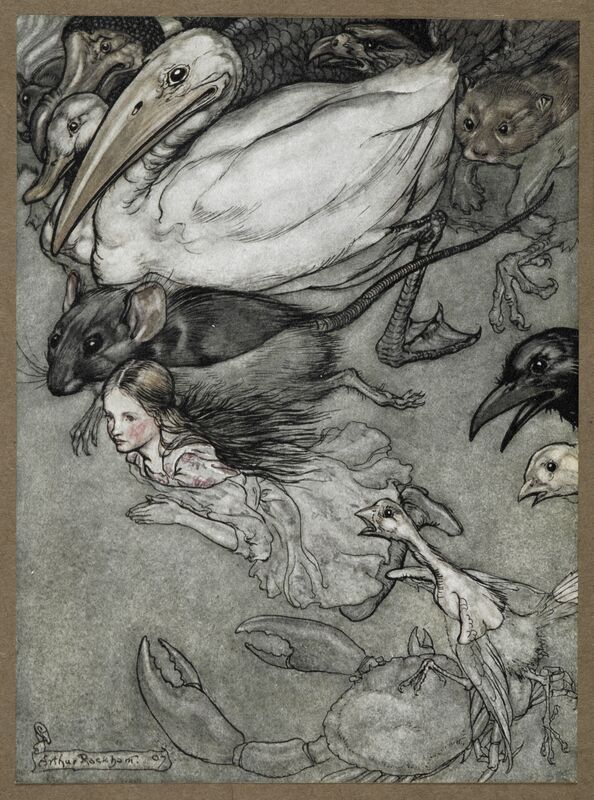 We hold books on Arthur Rackham and E. H. Shepard, whose creations feature at the exhibitions mentioned above. When you browse the shelves with works classified at ‘Maw’ on Level 5, go also towards the far end to find the “Oversize” books on the subject. Otherwise, you may miss a title with plenty of practical advice published at IOE Press in 2014: The picture book maker : the art of the children’s picture book writer and illustrator. Also look on the catalogue for older items in the Stores (Stacks), which you can request to be fetched. Down there hide The illustrators of ‘Alice in Wonderland’! Other titles may be found with the non-fiction teaching resources on Level 4, like How to draw manga female action figures. Yet others are filed with the region they deal with: on Level 3, the lovely little book Through Eastern eyes is waiting for you. Produced by the NCRCL, it gives a brief history of Japanese graphic art and a snapshot of contemporary Japanese illustration. Of one of the artists discussed there, Satoshi Kitamura, we have a range of works: from the bright and bold Goldfish hide-and-seek for very young children to the comic-book-style Comic adventures of Boots to the compendium on prehistory folded into a subtly drawn and coloured story, Stone age boy. For something special to do research on, you could look beyond the Curriculum Resources Collection at the historical textbooks in Stores, for instance our Geography Textbooks Collection. Or analyse some graphic novels of Dickens or Shakespeare – or your pupils’ reactions to them! And did you know that we have created a category ‘Stories without words’ for you? You will be stunned how eloquent, for example, Window by Jeannie Baker and The Arrival by Shaun Tan can tell stories and deliver messages: Window observes the destruction of the natural environment, while The Arrival works through the fate of refugees in an alien country. Jeannie Baker’s style is colourful and decorative, Shaun Tan’s is sombre and surrealist; and both are truly original. You will find these two books on the picture book shelves to borrow and again in our Children’s Book Corner. I hope you get hooked on children’s books — and so the children you teach! This entry was posted in Curriculum Resources, History of Education, Library and Archives and tagged children's books, children's literature, exhibitions, illustrations, illustrators, Japan, picture books. Bookmark the permalink.